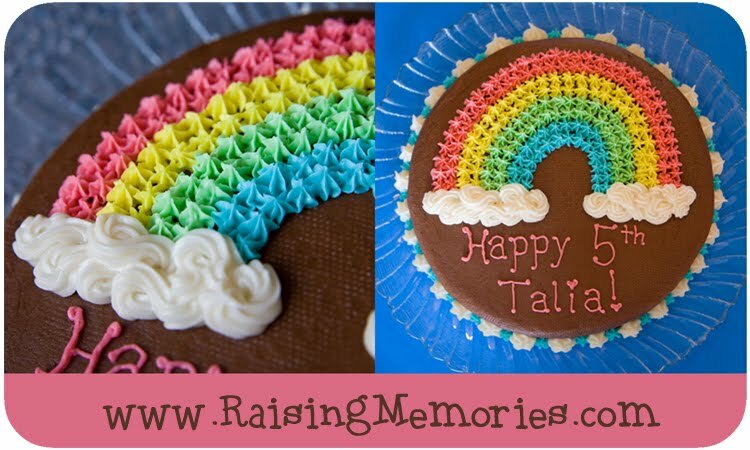 For Talia's birthday party I knew that I wanted to make a rainbow polka dot surprise cake. 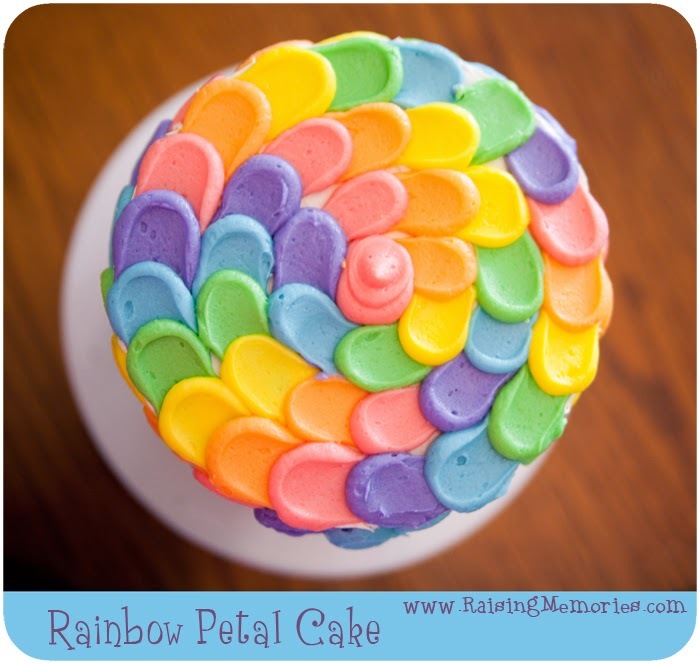 I wasn't sure how I would decorate it on the outside until I came across what is called a petal cake. I saw a rainbow one and knew I wanted to try it! 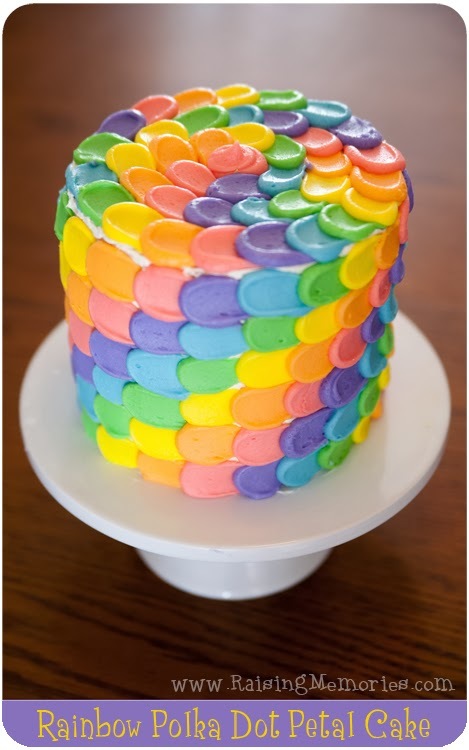 Since you can find tutorials to both of these types of cakes (linked at bottom of the post), I didn't make this into a tutorial, but I am going to share with you some helpful tips and tricks that I learned along the way! 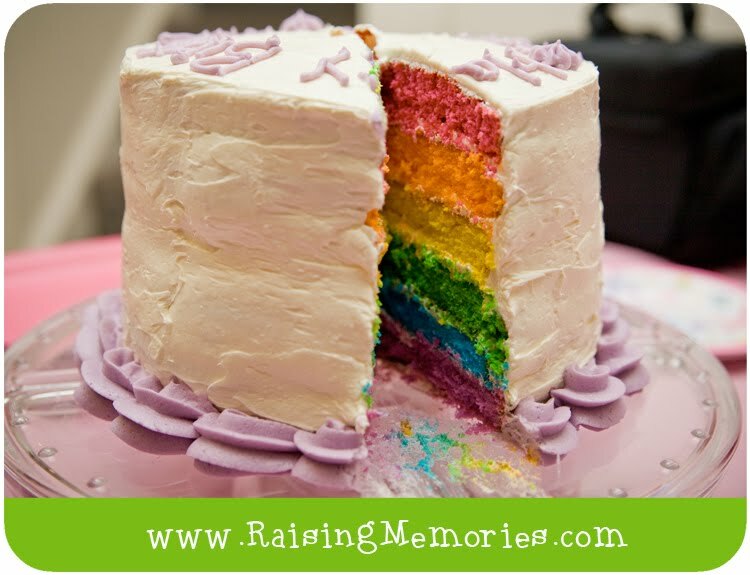 I used store bought cream cheese frosting for between the layers and a crumb coat (because I was worried that I would run out of the homemade cream cheese frosting that I used for the rainbow part). If I were to make the cake again, I would probably use store bought icing bags & just cut off the ends so that they would all be equal (when I made this one I didn't have 6 of the same size icing tip or bag, so I had a mixture of sizes to work with and try to make them look even). I was very happy with the polka dot interior of the cake! I made a lot of cake balls with one of these. I baked them for the recommended time (recommended by the information that came with the cake pop maker) which was fine, but I think I would do it for less time if I did it again, to avoid the brown edges of the cake pops (and polka dots). I used a whole cake mix for my cake balls and used the whole thing. I froze my cake pops because I made them a day early. I didn't quite use all of them, but I did completely fill my cake pans with cake pops before adding the white cake batter. This was a good move because we always had polka dots- wherever we cut the cake. 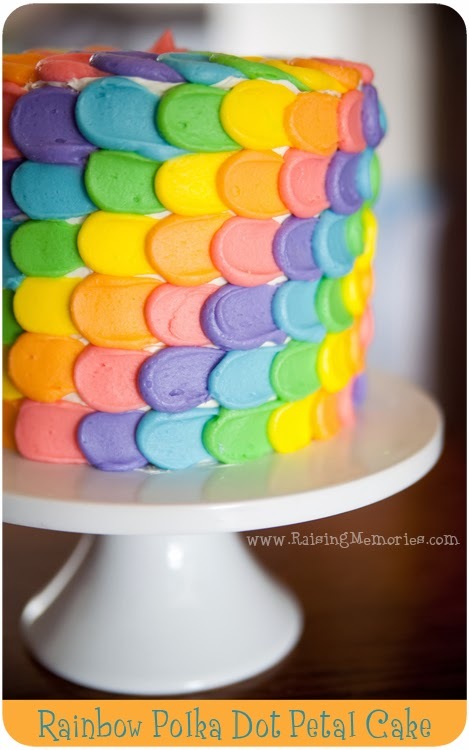 I have seen other cakes like this where the cake pops were more sparse (and therefore there weren't always polka dots, depending on where you cut the cake). I have read about people using different cake recipes for the cake balls than the rest of the cake- trying to make the cake balls more dense so that they don't float.. something like that. I didn't bother doing that and I think it turned out just fine! So, I would say don't worry about using different types of cake! I made 3 6" layers, so it was a small diameter but the cake was tall, so I could cut thin pieces and we had more than enough cake to go around! So a total of 3 white cake mixes: one cake mix for the cake balls, and two cake mixes for the cake layers (divided into 3). I only had one cake pan to work with. It would've been ideal if I had three 6" cake pans because I could've baked them all at once. But it worked fine with just one. I was excited to see how it would look when I cut it and very happy with the result! 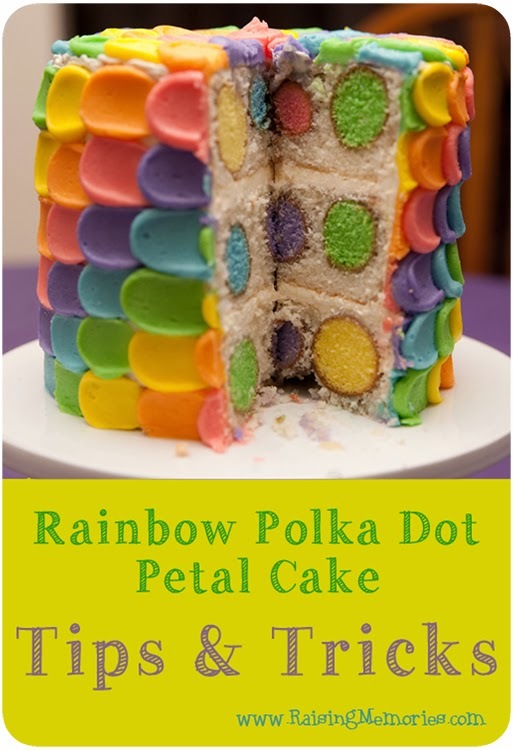 There are some other tips included with the polka dot cake tutorial that I will link to below that I used and worked well for me, but there were some that I didn't bother to do and it worked out just fine for me. For example, I didn't add anything unique to my cake mixes- I just followed the box instructions (using only egg white so that the colours would turn out well, but not adding pudding mixes or anything). But I did follow her instructions about covering the bottom of the pan just a bit with cake batter before placing the cake balls. And I tried to get batter in between each of the cake balls and cover them all. That was a bit tricky with how full my pans were with cake balls, but it worked fine. ALSO, one more tip: Freezing a cake that's already decorated: The morning of Talia's party, there had been a TON of snow, and the plows didn't get out in time to make the drive safe for everyone to get here. Ken had been outside shoveling the driveway and had to push a couple of people out of our street! So, we had to postpone Talia's party (from a Saturday to a Friday) and I had just finished decorating the cake when we made that decision! (This cake was a fair bit of work, so I was not about to make another one a few days later! ;) So, I put the cake (cake plate and all) in the freezer for several hours (5 or 6 maybe- but I think I read that 4 is enough) so that the icing would be very hard. Then I took it out and covered it with a couple of layers of plastic wrap. I left it in the freezer like that for almost a week and took it out the morning of the party (which would take place in the afternoon). I left it in the fridge for a couple of hours (still covered) then uncovered it and left it in the fridge until an hour or two before the party (I forget exactly) and it was in perfect shape! I was very happy with how well the freezing/thawing process went! The elements of this cake were not my original ideas. I found both ideas through Pinterest and decided to combine them - I found and followed this tutorial & frosting recipe to decorate the outside and this tutorial for the inside of the cake. I used this cake plate from Minted.com (was provided as part of an exchange for a previous sponsored post). So cute ! I always love to think I could do something like this ! Lol good job ! I've never seen that! SOOOO adorable! I'm going to have to make one! Thanks for the tips! Thanks! :) It was a really fun cake to have at the party! I LOVE this! I just started a website, www.realimprints.org, and it's dedicated to sharing the good, the real, and the inspiring! I'd love your story on our blog! It would bless so many other Moms. We would obviously link to your site as well. Check it out! See if it's something you'd be interested in doing. I love your site and will definitely be following you! Beautiful cake! 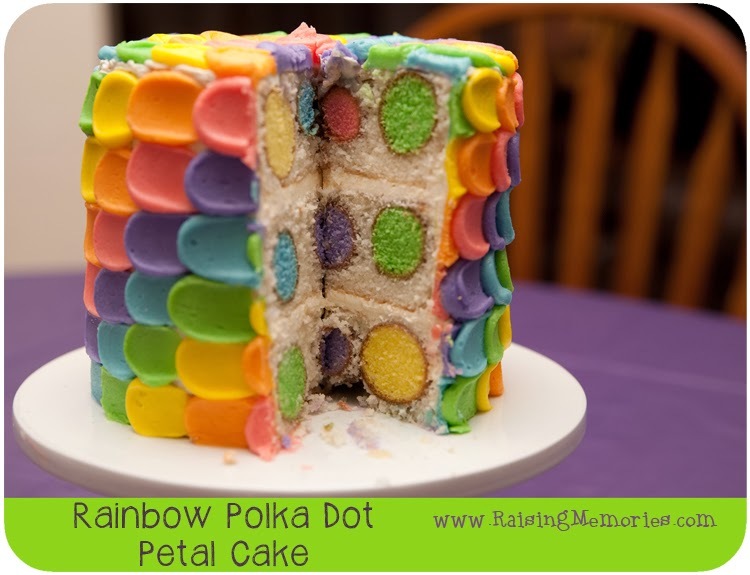 I tried the polka dots before and everything overflowed! Yours definitely looks so much better! Its fun to see and I really like the outside. Just might have to try again for my next daughter's baptism. Thanks! Oh my gosh.. I want your talent.. My daughter had a rainbow art party a few years ago and this would have been perfect! G'day and WOW you have a lot of patience heather, true! OMGGGGG so much do this for my girls upcoming bday party! That's a really neat idea! Thanks! 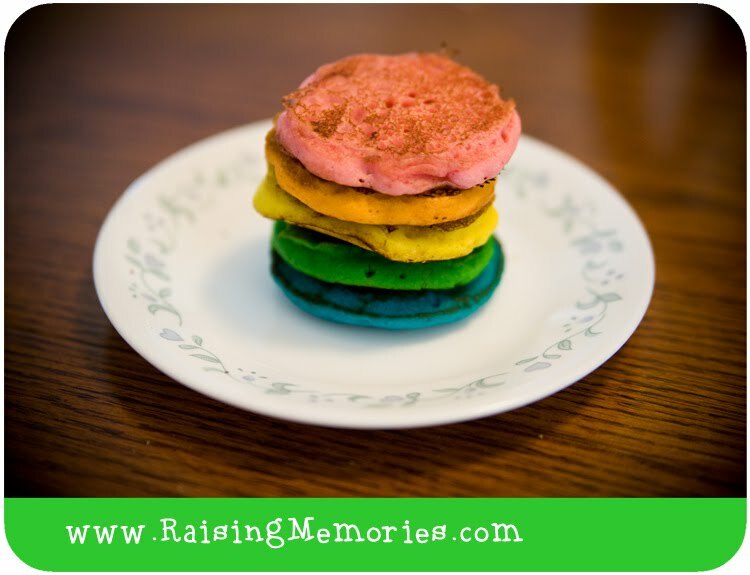 I am TOTALLY making this for my daughter's bday in May! Thank you for the tips. I am making this for my daughter's birthday party and am very nervous. I wish you had done a tutorial because it was so hard to print the recipe from the polka dot blog. But I think I finally got it. Thank you for sharing. This is beautiful! You are amazing to care about your children so much to do this for them. 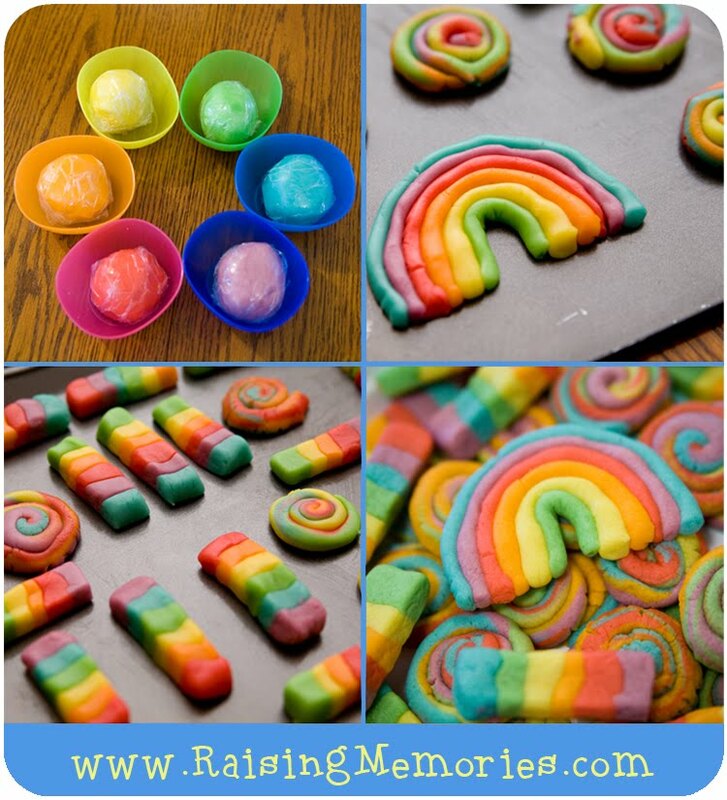 This is adorable I just had a cookie dough disaster I doubt I could make anything like this. im just loving these pretty colors.beautiful !! I'm going to try this for my Daughters next birthday. Thanks for the helpful tips. Wow! This is amazing! I love all the rainbow colors! How fun! Love, love, love this! Thank you for the tips! I never would have thought of putting cake balls into a cake mix! Beautiful frosting! Pinned. This is gorgeous! What a cool idea. I need to try this. LOVE this! Pinning it to give it a try. Glad I saw it Spring Fever w/ Inspired Bloggers. I LOVE this!! So fun and bright and springy! I just have my first little girl 6 weeks ago, but I think I'll be making this for her first birthday!! 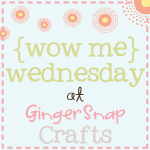 I'll be featuring you over at Someday Crafts tomorrow morning. Super impressive! I want to do this for my girls 3rd birthday! Wow! Amazingly artistic and the results are beautiful! Almost too pretty to eat! My boys would go crazy for this cake! What a cute cake! Perfect for every occasions! Beautiful cake. I had to read the post to see how you did it, cake pops! I'd never of guessed. Great job! 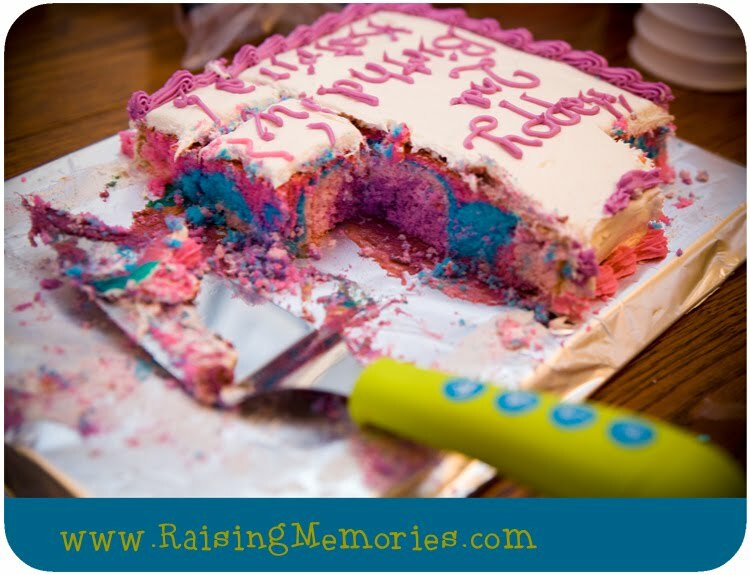 I have a cake pop pan too, I wonder if it would be fun to make a "rock" cake for a boy? Chocolate cake for soil, and gray or tan colored "rocks" topped with green icing and gummy worms? I'll have to ask him :) Thanks for the idea. What a cool cake! Never made on like this. My son is all into rainbows right now. I may make this for him. You put so much effort into this and it looks incredible. I see what you mean about the brown around the polka dots, but it looks amazing. Well done. I love the frosting. Just beautiful! Everytime I see this cake I have to stop and look it really is beautiful,you my friend are very talented and have much patience ! wow this looks yummy! Love the creativity! This is such a pretty cake. Great job!!! Thanks would like to make with my grand daughters.